Cats have permanently found a new home on YouTube, blogs and social networks. Type "lolcat" (aka "laugh-out-loud-cat") into Google Images and over 5 million results will surface. These feline critters are more than often the "coolest of cats" who are fully cognizant of their GQ factor and flaunt it whenever they can. Enthralled by today's cat-zeitgeist, even brand marketers are capitalizing on corralling cats for greater online exposure. 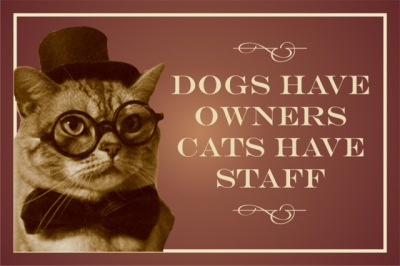 Emily Huh, editor-in-chief of widely popular pet humor blog with the unlikely meme of "I Can Haz Cheezburger" suspects the "cat popularity" trend comes down to cat-people versus dog-people behavior. “Unlike dog lovers who have dog parks as a place to socialize, cat people socialize on the Internet, which is like a giant litter box of cat lovers,” she says. Reaching over 20 million people each month, the website has given "cool cats" a place where they can hang their fur balls, get laughed at and appreciated for all of their feline quirkiness. Cats are a such a "win-win" when it comes to the Internet, one has to ask themselves, how can businesses benefit from the seemingly never-ending trend? Well John St., a Toronto ad agency came up with a hilarious viral video (now tracking over 1.6 million views on YouTube) to tackle just that burning issue. Up for this year's 2012 Webby Awards, their video entry titled "Catvertising" parodies the cat craze, by pretending their agency has re-branded itself to produce nothing but cat videos.